which is not what I wanted or expected. Can someone please explain what's going on, and how to get around it? When you write [x]*3 you get, essentially, the list [x, x, x]. That is, a list with 3 references to the same x. When you then modify this single x it is visible via all three references to it. which will reevaluate *4 each time instead of evaluating it once and making 3 references to 1 list. You might wonder why * can't make independent objects the way the list comprehension does. That's because the multiplication operator * operates on objects, without seeing expressions. When you use * to multiply [ * 4] by 3, * only sees the 1-element list [ * 4] evaluates to, not the [ * 4 expression text. * has no idea how to make copies of that element, no idea how to reevaluate [ * 4], and no idea you even want copies, and in general, there might not even be a way to copy the element. The only option * has is to make new references to the existing sublist instead of trying to make new sublists. Anything else would be inconsistent or require major redesigning of fundamental language design decisions. In contrast, a list comprehension reevaluates the element expression on every iteration. [ * 4 for n in range(3)] reevaluates  * 4 every time for the same reason [x**2 for x in range(3)] reevaluates x**2 every time. Every evaluation of  * 4 generates a new list, so the list comprehension does what you wanted. Incidentally,  * 4 also doesn't copy the elements of , but that doesn't matter, since integers are immutable. You can't do something like 1.value = 2 and turn a 1 into a 2. Thanks for the explanation and the workaround. I am still surprised though that the outer list ends up holding three references to an anonymous inner list. I am surprised that no body points out that, the answer here is misleading. [x]*3 store 3 references like [x, x, x] is only right when x is mutable. This does't work for e.g. a=*3, where after a=5, a=[5,4,4]. Technically, it's still correct. *3 is essentially equivalent to x = 4; [x, x, x]. It's true, though, that this will never cause any problem since 4 is immutable. Also, your other example isn't really a different case. a = [x]*3; a = 5 won't cause problems even if x is mutable, since you're not modifying x, only modifying a. I wouldn't describe my answer as misleading or incorrect - you just can't shoot yourself in the foot if you're dealing with immutable objects. @Allanqunzi you are wrong. Do x = 1000; lst = [x]*2; lst is lst -> True. Python does not distinguish between mutable and immutable objects here whatsoever. Technically, you could turn a 1 into a 2, but it isn't as simple as 1.value = 2. @ᴡʜᴀᴄᴋᴀᴍᴀᴅᴏᴏᴅʟᴇ3000 import ctypes; ctypes.cast(id(1), ctypes.POINTER(ctypes.c_int)) = 2, but prepare for weird behavior or a segfault. Important thing to note here is that * operator is mostly used to create a list of literals. Since 1 is a literal, hence obj =*4 will create [1,1,1,1] where each 1 is atomic and not a reference of 1 repeated 4 times. This means if we do obj=42, then obj will become [1,1,42,1] not [42,42,42,42] as some may assume. It's not about literals. obj = 42 replaces the reference at index 2, as opposed to mutating the object referenced by that index, which is what myList = ... does (myList is a list, and the assigment alters the reference at index 0 in tha list). Of course, integers are not mutable, but plenty of object types are. And note that the [....] list display notation is also a form of literal syntax! Don't confuse compound (such as lists) and scalar objects (such as integers), with mutable vs. immutable objects. Creates a list that references the internal [1,1,1,1] 3 times - not three copies of the inner list, so any time you modify the list (in any position), you'll see the change three times. where it's probably a little less surprising. You can use the "is" operator to discover this. ls is ls returns True. Noticed why doesn't modifying the first element of the first list didn't modify the second element of each list? That's because  * 2 really is a list of two numbers, and a reference to 0 cannot be modified. In simple words this is happening because in python everything works by reference, so when you create a list of list that way you basically end up with such problems. In this b is a list that contains one item that is a reference to list a. The list a is mutable. We can see that the list c now contains two references to list a which is equivalent to c = b * 2. 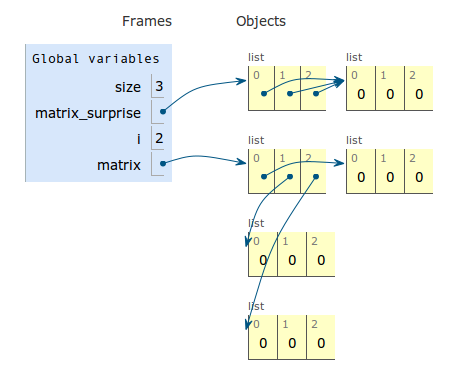 Python FAQ also contains explanation of this behavior: How do I create a multidimensional list? So now let us go step-by-step. You have x which is 1, and a single element list y containing x. Your first step is y * 4 which will get you a new list z, which is basically [x, x, x, x], i.e. it creates a new list which will have 4 elements, which are references to the initial x object. The net step is pretty similar. You basically do z * 3, which is [[x, x, x, x]] * 3 and returns [[x, x, x, x], [x, x, x, x], [x, x, x, x]], for the same reason as for the first step. Initially I was thinking, how is it possible to come up with these random numbers from your simple example. You really have to mention what id does before you throw this code at people. I've put your image inline. For future reference, you really need to explain what you're linking to. So, why if we write matrix= [[x] * 2] doesn't make 2 elemnts for the same object like the example you describe, it seems to be the same concept, what am i missing? @nadrimajstor so why the change in matrix doesn't affect matrix like the example above with 2d matrix. As lst is nothing but lst1. In this case, the expression is re-evaluated for each n, leading to a different list.